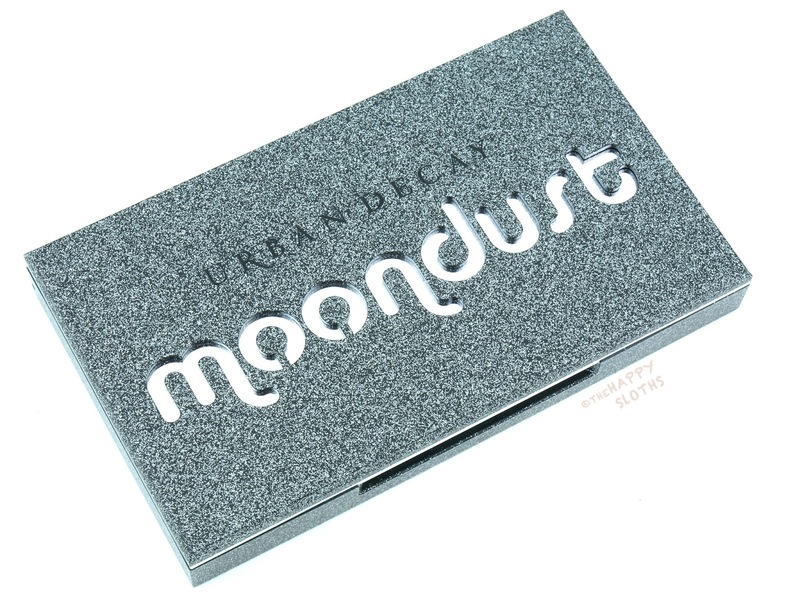 The Moondust Palette comes in a beautiful silver glitter-covered black plastic palette. The super-fine glitters are embedded within the plastic so there are no pesky fall-outs. The lid features some awesome cut-out letters with a reflective backing for a unique look. 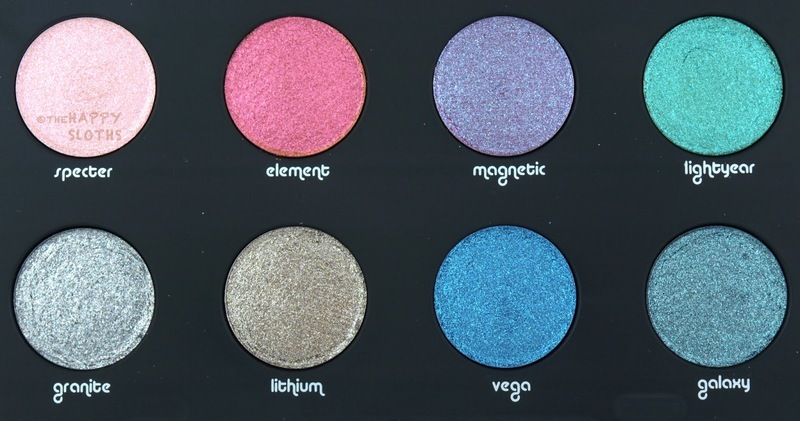 There is a total of eight shadows in the palette and they are 0.7 grams each, half of the regular individual Moondust shadows. Even though the palette didn't include a brush (which I never find very useful), it still is a tad large considering that there are only eight shadows inside. I would have preferred a more compact palette but I do appreciate the nice quality and design. 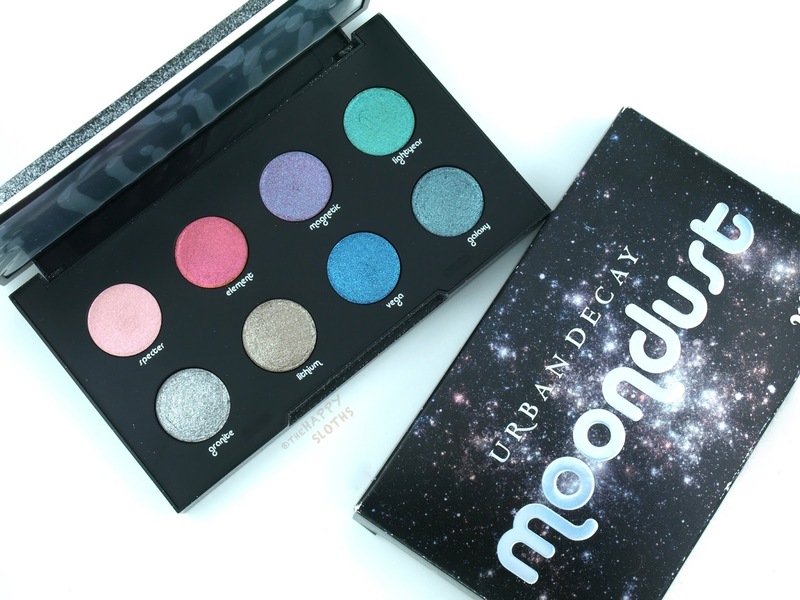 The Urban Decay Moondust shadows are ultra-sparkly eyeshadows that promise a smooth and non-chunky application. All eight colors are brand-new shades and they are all very easy to work with. The colors apply best with the fingertips and they adhere very well to even bare lids. There is minimal fall-out; a couple of the shades feel so buttery and smooth they could probably pass for regular shimmers. In terms of pigmentation, the shades vary quite a bit; however, although some shades appear sheer, they are all packed to the brim with glitters, it's only the base pigment level that varies. Specter: Pale pink with iridescent sparkles. This one is mostly sparkles with no base pigment. Element: Stunning orange-red glitters with a gold shift effect. Again, this one is mostly sparkles with no base pigment. Therefore, it would work best on top of a regular eyeshadow. Magnetic: This is a beautiful purple-blue duo chrome. 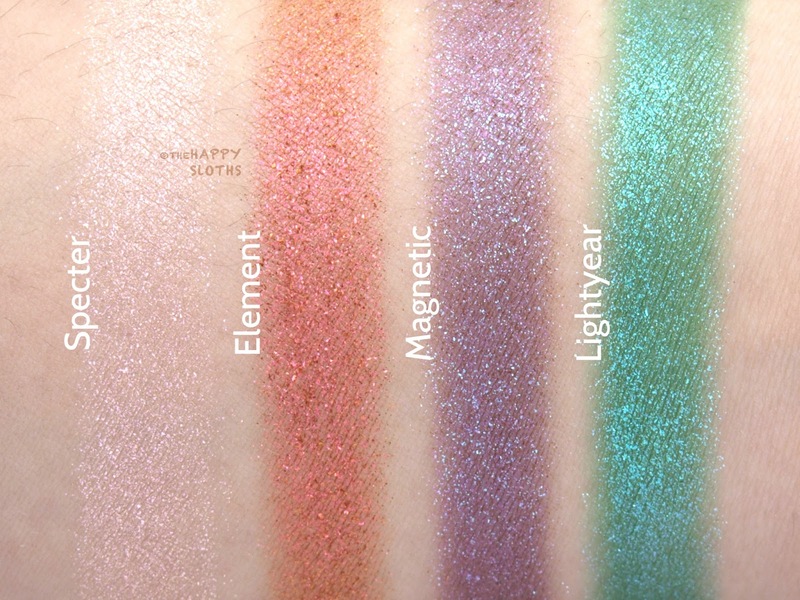 Again, this is a slightly sheer color, making it more suitable as a glitter topper versus a stand-alone shadow. Lightyear: This is a lovely green packed with blue-lavender sparkles. 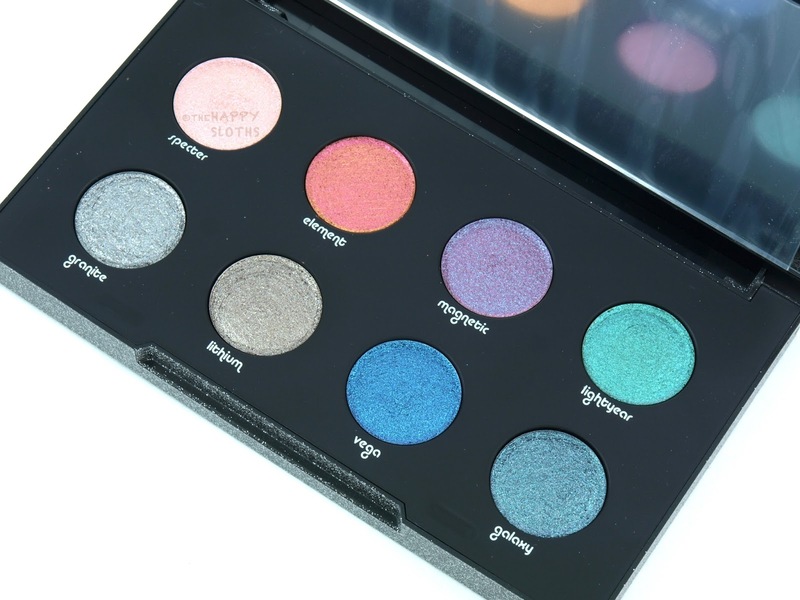 The color is quite pigmented so it will work well on its own. Granite: This is a nice gunmetal gray with silver sparkles. Lithium: Medium bronze with shiny gold iridescent glitters, Lithium is very rich and pigmented. 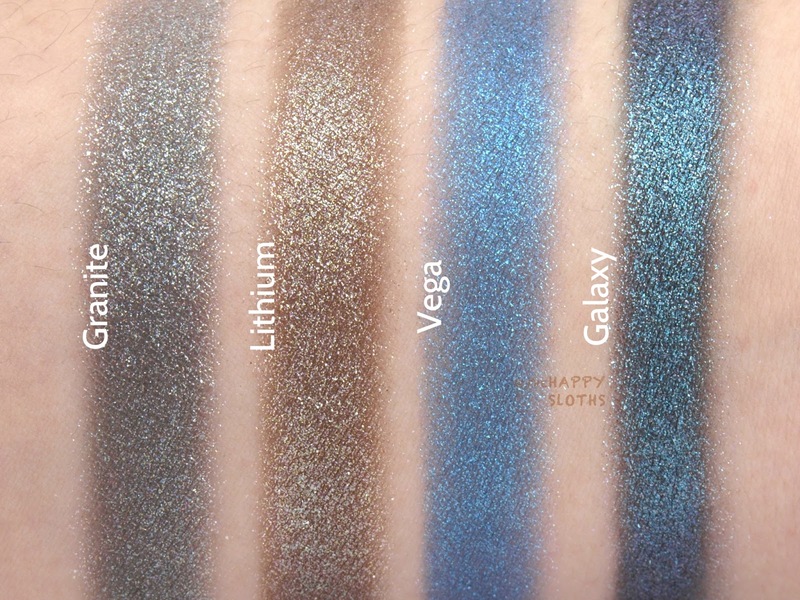 Vega: Beautiful blue packed with blue-purple glitters. Galaxy: Probably my favorite out of the bunch, Galaxy is a beautiful black-based blue-lavender glitter. The color is super rich and the duo chrome effect is very strong! Urban Decay is available in stores and online at Sephora.